Lee's Boston Drum Builders Blog: Nokes & Nicolai . . . Hydrocarbon Engines??? Nokes & Nicolai . . . Hydrocarbon Engines??? Okay here is an odd post relating only tangentially to drums whatsoever . . .
Boston's Nokes & Nicolai enjoyed a what appears to have been a reasonably successful albeit somewhat modest fourteen year existence from 1912, when they took over the operation of F. E. Dodge, until 1926 when they were acquired by the Liberty Musical Instrument Company of Chicago. It is well known that Nokes & Nicolai produced and sold a full line of drums, traps, keyboard percussion instruments, and timpani as well as banjos. But what interest did the company's namesakes Enes J. Nokes and Edward F. Nicolai have in hydrocarbon engines??? 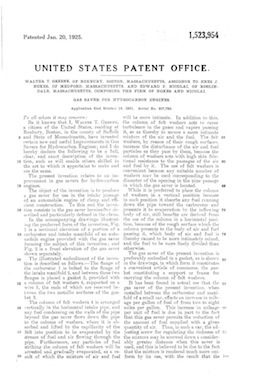 U. S. Patent 1,523,954, claiming to offer "useful improvements in Gas Savers for Hydrocarbon Engines", was applied for on October 14, 1921 by Walter T. Greene of Roxbury, MA. 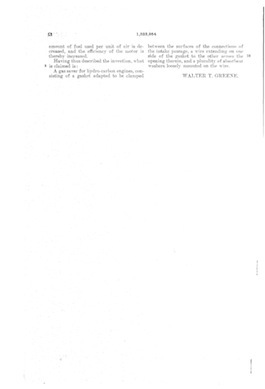 The patent was granted on January 20th, 1925 and was assigned, curiously enough, to the firm of Nokes & Nicolai. Now, why on earth Nokes & Nicolai had any interest at all in hydrocarbon engines, I have no idea! So I'll offer up a wild guess or two here with absolutely nothing to back them up. 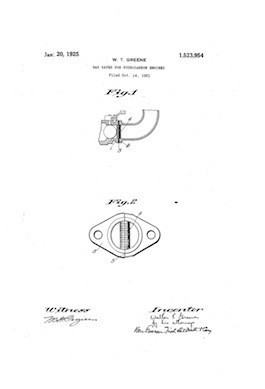 Maybe this device, described as "a gasket adapted to be clamped between the surfaces of the connections of the intake passage, a wire extending on one side of the gasket to the other across the opening therein, and a plurality of absorbent washers loosely mounted on the wire" , was so simple in construction that it could have been an easy item to assemble at the Nokes & Nicolai factory. Or could it be that in the interest of diversification that the company's owners were in some small way hedging their bets by venturing into other areas of manufacturing? This would be the the first and only piece of evidence I've come across that would suggest as much, but maybe it is possible. This seems sort of unlikely, however, seeing as how the musical instrument business was booming in the early 1920s even for a smaller company such as Nokes & Nicolai. Or was it that by the time Greene's patent was granted in 1925 that the handwriting was on the wall and the end was growing near for Nokes & Nicolai? By the mid 1920s it would appear that, not unlike their Boston drum building counterparts, the company was likely falling behind in terms of modernization and was unable to evolve and grow to the extent needed to compete with the industry titans of the Midwest. Maybe a venture into other areas of manufacturing was a last ditch effort to feed the operation in Boston and prevent selling the company. All of this is purely speculative on my part. It could just as well be the case that nothing at all ever came of the patent being licensed to Nokes & Nicolai. Or perhaps there was simply a friendly business arrangement between Nokes, Nicolai, and Greene. We may never know. What is for certain however is that Nokes & Nicolai is much better remembered for their drums and percussion instruments than any contributions they made to the automobile industry! Do you have a percussion instrument manufactured by Nokes & Nicolai? I want to hear from you! Send Lee an email at lee@vinson.net.